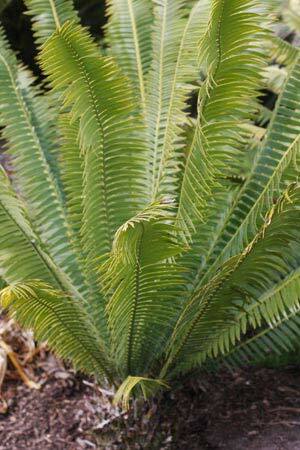 It looks like a fern, is commonly called the Gum Palm or ‘Giant Dioon’ however Dioon spinulosum is actually a cycad. Native to the forested areas of Mexico and nearby areas of central America this is a very attractive landscaping plant. Characterised by long fern like fronds this cycad is adaptable, it grows well as fare south as Melbourne, and will throve in Brisbane and further north. Although Dioon spinulosum can reach great height, in cultivation this slow growing species will reach around 3 – 4 meters. It will form a stout trunk, and with a broad spreading crown of gently drooping fronds makes a wonderful specimen plant. Pictured right we have a young specimen that is yet to form a trunk. These smaller plants take well to growing in containers and can even be grown as indoor plants if desired. Best in dappled shade, the foliage tends to burn in full sun in warmer climates. A humus rich well drained soil is best and a little added lime seems to help with growth. Young plants can successfully be grown in containers for a number of years. Container grown plants are suited to growing indoors. Height – Over time 15 meters. Climate – Best in sub tropical areas, however will grow in cooler climates in a protected position. Position – Dappled shade to sun. Growth Rate – Slow, faster in warm tropical climates.